The microphone is attached to a podium. Nothing funny has ever been said at a podium. In addition, he and his family are standing onstage with me. He was standing there the whole time while people were giving their speeches, so it seemed appropriate to do the same for me. So now he’s forced to laugh because everyone else is watching him and me, and it feels wrong not to laugh. Except he’s the only one laughing. I’m bombing so hard I can feel the earth rotating underneath my feet and my old friend, loyal to the end, is standing beside me, laughing alone. Is the sound of one person politely laughing worse than silence? How about when you are the “gift” from his company for his retirement? I did my 30 minutes, apologized profusely for ruining a half-hour of this wonderful man’s retirement party, and then wondered how much it would cost to send the company the plaque they should’ve given him. Curling is an inherently funny sport — let’s face facts — but Cullen has more than enough material to work with through his observations of life’s absurdities so that he doesn’t have to narrow his audience to just those who understand the difference between an inturn and an outturn. But rest assured, when Cullen — the lead-rock thrower for Dean Joanisse’s New Westminster team that lost the B.C. final in an extra end this past season — takes the stage on July 24 at the world-famous Just For Laughs comedy festival, curling will be mentioned. His face straining with each quick, powerful push of the broom as he feverishly tries to drag his skip’s rock into the house, a bespectacled John Cullen, slim and fit at 28, looks every bit the serious curler. Take him off the ice-sheet, however, hand him a microphone and he turns into a funny man. Cullen the Comic, a wise-cracking, irreverent stand-up comedian who easily pokes fun at himself and his life as a substitute teacher. Cullen has achieved much in the few years he’s been in the scene. He’s signed as a Yuk Yuks comedian, which provides him a larger, more frequent stage to hone his craft. Unsurprisingly, Cullen’s immediate successes aren’t attributed to luck or fate, but to being a seasoned performer. Link: The Province’s Most Eligible Bachelors. Up next was John Cullen. Now, this guy…this guy is good. Cullen…proves that younger guys can be just as funny as even the most seasoned comics who have been telling jokes their entire lives…He’s energetic when he has to be, but calm and collected when his jokes take a slower pace. 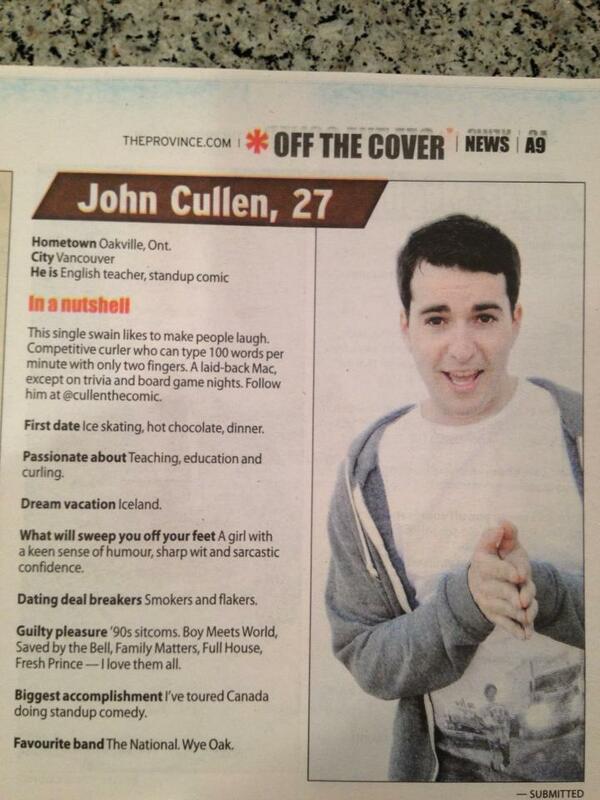 He’s another one to keep your eyes on, Vancouver…Cullen is excellent. And with a couple more years of writing and practice, he’s going to be phenomenal.